Cracking to my Plaster, Is it a Structural Problem? 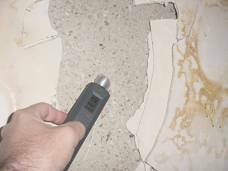 Cracking to plaster – what can it mean? Our highly qualified independent surveyors will offer you advice on your property problems and can carry out a building survey for you on both residential or business properties. 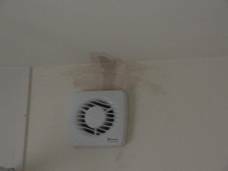 We also carry out many Specific Defect Reports on things such as cracking, dampness and condensation. We are here to help you with all property matters. Please free phone us on 0800 298 5424 for a friendly chat with a surveyor. 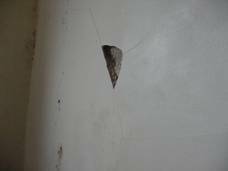 Cracks in your walls – what does it mean? This article looks and considers cracks in plasterwork. 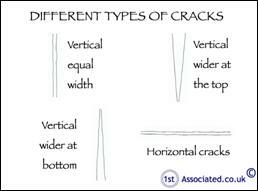 Cracks are one of the most common reasons for people phoning us. Often the cracks can be something that they saw as they walked around a potential new house and home. 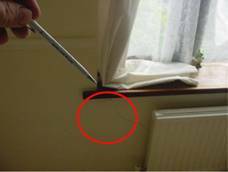 However equally we have been called by people living in a property and they have noticed cracks occurring. We don't wish to be alarmist with regards to cracks as some cracks can simply be seasonal changes and variations in a house as you get what is known as differential movement when a houses components move at differential rates and cause cracks to a property. 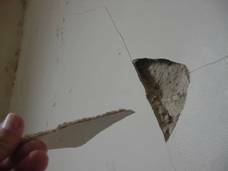 Below are a range of cracks that we have identified during structural surveys and building surveys that we have carried out. Some are barely noticeable in the photos but they have been identified by the red circles. We, of course, record these during the survey. 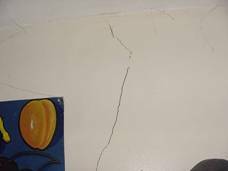 The question is are these cracks structural and a problem with the building resulting from settlement, subsidence or heave? Before we go into too much detail about cracking we just need to say that we have written the article to show how we use lots of sketches and photos in our structural surveys and building surveys. What do the circles and ovals in our building surveys mean? Basically they are they for you! We use circles and ovals on our photos and sketches where relevant throughout our building survey reports. This is just another tool we use to ensure we explain your property problems in the best way. Plaster is one of those things that doesn't get noticed, it's just there. It doesn't get noticed except by good building surveyors carrying out good quality structural surveys and building surveys. 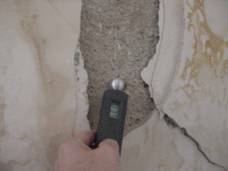 A good surveyor will be looking for signs of defects in the plaster indicating that there are problems in the structure as a whole but the cracks in plaster take many forms. It does need an experienced eye to understand exactly what cracks represent. 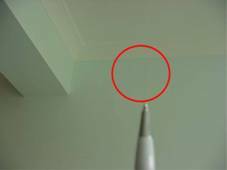 Do builders really know what they are talking about when they are looking at cracks in plaster? We have been surprised over the years how many builders diagnosed cracks in plaster as just being cosmetic and saying the best way is to plaster over them (is this because they want the building work?) and equally we have seen builders carry out work without really understanding what they are doing. This may be because of lack of knowledge or it may be because they are after work, we need to remember that a builder needs to build to make a profit, we simply don't know, but over the years we have been called out to homeowners and commercial property owners who have been concerned about cracks and listened to all sorts of stories as to how the builder thinks that the wall needs structural support or needs major work. Are builders insured to comment on structural problems? If the builder is so confident with regards to the work required, ask them to put in writing their recommendations and show that they are insured to comment on that sort of work. You will find that a few builders may do this, who will tend to be builders with specialist knowledge in this area, but generally they would refer you to a surveyor. First of all cracks can take many forms from what we will term a hairline crack, which is 1-2mm at the most to much larger cracks. 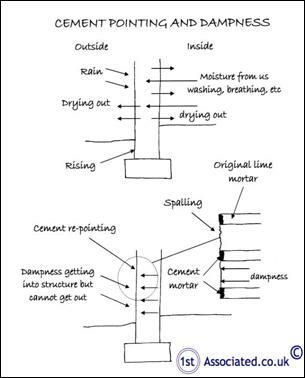 In fact there are guidance notes on how to describe such cracks that are used by Structural Engineers and Building Surveyors. Without wishing to get too technical we will stick to hairline cracks, structural cracks and non-structural cracks. 1. Dampness getting in via the poor detailing on the roof and to the chimneys. 2 Dampness via the walls where work is needed. 3. Dampness via a sloping site into a suspended timber floor. 4 There may be other additional contributing factors such as nearby trees. 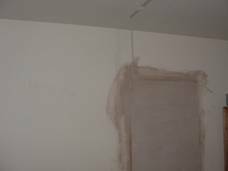 The above factors combined create a dampish building which due to the skim coat of modern gypsum plaster is very visible in a property. Whilst modern plasters and old plasters can look very similar they behave very differently. 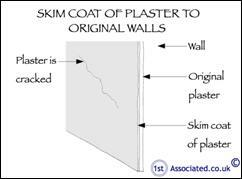 An old plaster is likely to have a largish lime content and is what should be used on older properties as it then means the walls are breathable which will reduce / remove any dampness in them. It should be remembered that an older property will never be absolutely free of dampness in the walls as it was constructed to have some dampness in it and this will then dissipate over time with the breathableness of the walls. 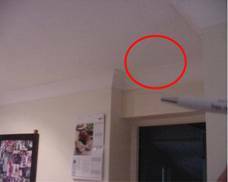 Many people buy an old property and find that the plaster is hollow and literally falling off the walls. This is often due to dampness in the structure that has been allowed to, for many years, penetrate inside the property. We think it also may have something to do with the warmer inside climate drawing the dampness in. This has then meant that the plaster has lost its grip or key on the wall and formed a blister behind the plaster for want of a better term. 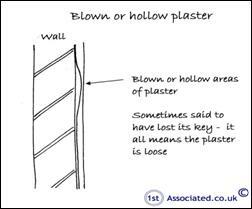 This is known as blown or hollow areas of plaster and is said to have lost its key. Often the answer when you speak to a plasterer, as you would imagine, is that it needs replastering. 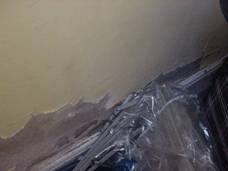 We have also come across some instances where it is better to use a lining paper than to replaster particularly if the plasterer only knows how to plaster in a modern gypsum plaster when the property is an old property and should have lime mortar. Modern plasters just can't compare and compete with older lime plasters however we use them because they are cheap and quick (where have we heard this in the building industry before!). As such, the skilful tradesmen that use old lime plaster tend to disappear. 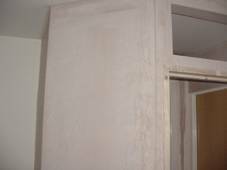 Something that is very common is something that is known as dot and dab plastering. This is literally where many dots of plaster are applied to a wall and these are then flattened out by plasterboard being bedded against them to create what is known as a dry lined wall or a false wall. 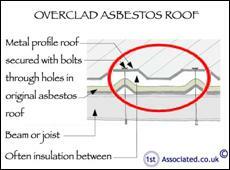 Most modern houses are constructed in this way which does add an extra layer of insulation. 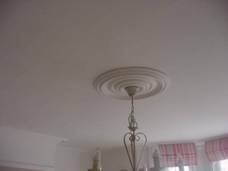 It is also quick as there isn't the same sort of drying time that we have with a modern gypsum plaster. 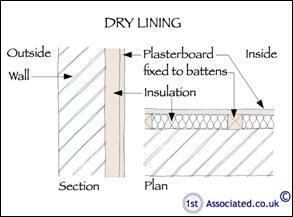 Dry lining is usually used on solid walls, particularly where dampness is occurring it can be used to hide the dampness. In older properties, where the internal wall is not flush, battens would be added and then lath and plaster. A good plasterer can really change how a property looks. 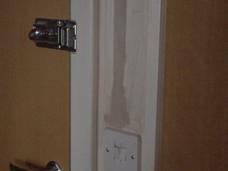 We have been so impressed by some plasterers in the past that we thought it would be a good idea just to leave the plaster finish however most of the homeowners that we dealt with didn't! Here are a few examples of how good plaster can look (in our opinion). 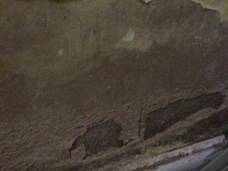 We must remind you that a modern gypsum plaster simply can't cope with dampness in the same way as an old lime plaster. In this instance the photos we are showing you are of a studwork wall which has been plasterboarded and then the joints taped and a skimcoat of plaster added. Does modern plaster last as well as old plaster? 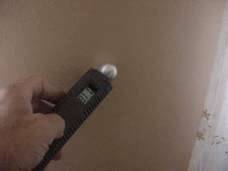 We were quite surprised recently when one of our trainee surveyors said to us that they had noticed how some of the modern houses in the properties that we manage were not lasting as long as some of the older properties that were plastered in the older style lime plaster. This was great to hear from a young surveyor who noticed, even in his short time of surveying of around three years, that modern plaster has to be looked after a lot more than older plaster. It certainly doesn't take use and abuse in the same way. We recommend that should you decide to have a building survey with us you meet us at the property during the survey to discuss further any issues such as cracking you have and also for us to show you what we have found. Please free phone us on 0800 298 5424 for a friendly chat with one of our surveyors.